Mariya Goncheva shows you how to combine yogic lifestyle, nutrition and practice to provide yourself with a complete mastery of your digestive system, remove toxins, and give a youthful appearance to your skin. 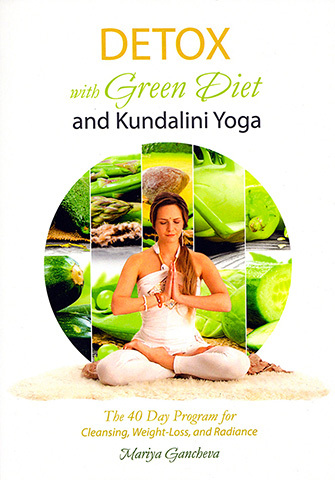 Reinvigorate and reboot your entire body when you follow the 40-day transformational program revealed within her insightful manual Detox with Green Diet and Kundalini Yoga. Wake up feeling refreshed and full of energy, focused, driven and happy. Your body will be lean and light. In short, the new you will feel pretty amazing. When Mariya first started on her journey of self-discovery, she found herself swayed in different directions. Filled with feelings of helplessness and confusion. she knew she needed to change something, and quick, as her health was deteriorating, as her body grew weaker and heavier. She just could not gain control over her emotions or eating habits. Needing an answer, a quick and definitive tool to restore her balance, she characteristically threw herself relentlessly into a search for one. You will learn from her discoveries about the basics of nutrition, toxins, detox, lifestyle, and supplements. You will also learn exercises, meditations, and breathing, based on the practical and ancient wisdom of Kundalini Yoga, to increase your awareness and control your mind and emotional states. Challenge yourself to change your habits from self-destruction to self-love and happiness. Buy this book and immediately begin transforming from within! Mariya Gancheva is a a transformational leader, author, teacher and full-time investment banker in London. She is the embodiment of a modern woman who has managed to integrate the wisdom of the East into the fast-paced lifestyle of the West.